Are You Over Optimizing Your Websites And Pages? Today I wanted to highlight the importance of not “over optimizing” your websites and webpages. Long gone are the days when you could just include your main keyword in your page title, meta keywords, header tags, alt text and article content in order to rank highly. In the last 12 months such tactics will lead to dropped rankings and your websites traffic being “throttled”. In many cases you do not even need to include your target keyword in order to rank for that keyword. Sound odd? Well it is true. In fact, in many cases if you even include your target keyword in your page title you will not RANK anywhere near the top in Google. 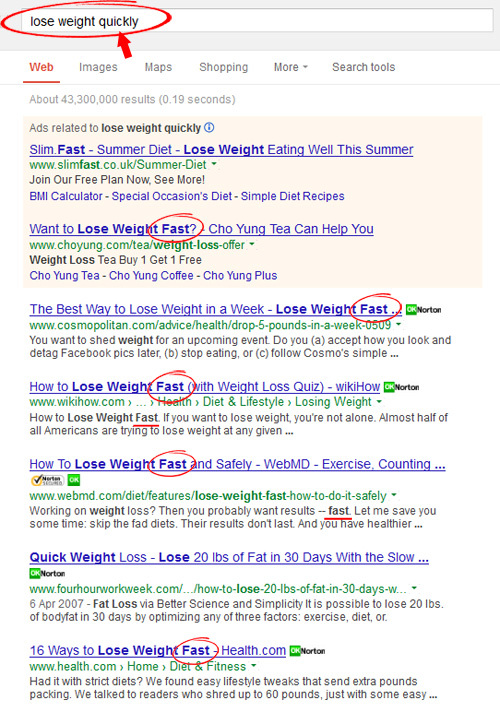 Instead you will see that Google has favoured the word “fast” rather than “quickly”. If you were trying to rank for the keyword “lose weight quickly” you would rank higher for that keyword if you optimized your page for “lose weight fast”. This is because Google regards “lose weight fast” to be more relevant than “lose weight quickly” and therefore shows results for the former rather than the searched keyword itself. I have included a screenshot below that proves there are a TON of pages in Googles index that are optimized for the keyword “lose weight quickly”. You can see above that there are approx. 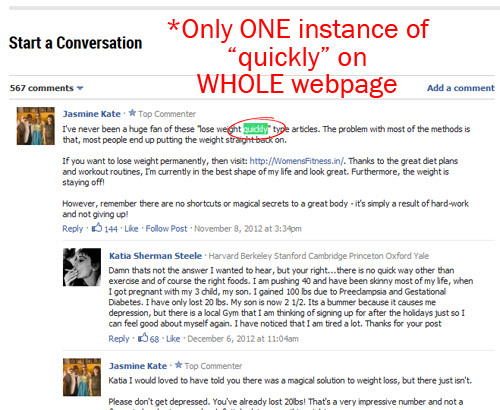 34,900 pages indexed in Google that have “lose weight quickly” within the actual page title. Yet NONE of these rank near the top. What is even more interesting is the fact that the no.1 result on page 1 of Google only has one instance of the word “quickly” within the entire page. So, The Question Is: How Are YOU Optimizing Your Pages? Here’s what to do when targeting a specific keyword. 1) First check that there are a decent number of pages that include your entire keyword within the page title. To do this simply use this search query in Google search: intitle:”target keyword” Obviously replace target keyword with your real target keyword. 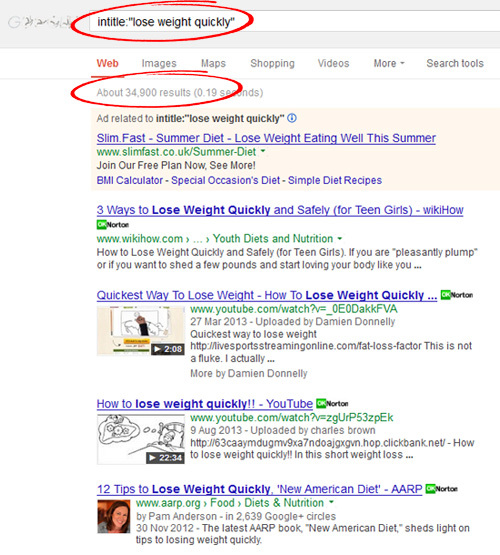 A) Is your target keyword in any of the page titles of the top 10 results? B) If not, then what words are showing in the top 10 results. Take note of synonyms and related words. C) Is your keyword or parts of your keyword found within the body of the webpages? D) Is you keyword found in H tags, alt image tags etc. This will paint a picture and give you an idea of how to best go about optimizing your webpage to give you the best chance of ranking it in Google. To Recap: Don’t over optimize your pages and instead focus on words that appear frequently within the top results. Before you go I wanted to let you know about an investment I made yesterday for my online business. In fact, it was a $297 investment and by the looks of it… was worth every penny. It was Don Wilsons brand new FB Ads Cracked course (plus software) and I’m sure by now you have had a TON of emails promoting it. The reason for this is that Don Wilson is the KING when it comes to making serious amounts with Facebook ads. He is known as the “1 cent click guy” because he knows how to generate thousands of highly targeted clicks for less than “one cent each”. Not only that.. but turn those clicks into serious money. Of course he backs this up with lots and lots of social proof. I’ve been following Don Wilson for a while now and I’ve always wanted to know how he does it… and thanks to his new FB Ads Cracked course and software I am now able to follow in his footsteps and utilize the huge potential that Facebook offers. He leaves no stone unturned! I’ve haven’t had chance to go through all of the course yet BUT I have managed to go through some of it and also take a look at the software tools that are included.. and let’s just say that I am extremely happy with my investment and am looking forward to pushing forward with it. I am NOT going to be promoting this today using my affiliate link purely because I don’t have any good, relevant bonuses to offer you.. however, if you are interested in grabbing membership to this course and really exploding your traffic potential then a great guy to grab this product through is Neil Napier. This is the guy who I bought my access through as he has some really awesome FB related bonuses… and Neil is also becoming a bit of a Facebook ads guru himself. Please note that FB Ads Cracked is only available for a few days so if you are serious about getting access then you need to act pretty quickly. Also, if you have any questions about Neils bonuses he will be more than happy to answer your questions.. so do feel free to leave a comment below. I hope you have enjoyed todays blog post and have found it beneficial to your online business and goals. Interesting topic. I was checking out my competition on majesticseo for a competitive keyword and found that the keyword was 80% of the anchor text listed. Now I would think that Google would penalize or at least not rank the site for this keyword but to my surprise the site is #9 in the serps. Now it could be that Majestic has not found all the backlinks to the site, but I surmise the keyword is still a high percentage of the total. I’ve also seen, as you’ve detailed in your post that sites are ranking for keywords with no backlinks for a specific keyword. Not quite sure what is going on in Googleland. Interesting blog post, i totally agree with you seo, has changed in recent years, infact this days if google sees you as an authority in a paticular niche, it tends to give you better rankings, it’s not really about the keyword per say, but the content of what is been delivered. Well presented and logical. Thanks for the easy to implement and inexpensive tip!